Let the experts at Good Housekeeping help you get organized with this inspirational room-by-room guide to tidying up! Hundreds of tips and tricks include how to keep a well-ordered fridge, gain extra counter space, conquer cookware clutter, choose the best shelving, clear up your desk and digital spaces, and streamline your closet and garage. You’ll find pro organizer ideas for every area in your home, must-have Good Housekeeping Institute-approved products, and advice on finding a place for everything and putting everything in its place. Keep this book handy, refer to it often, and say goodbye to the mess! 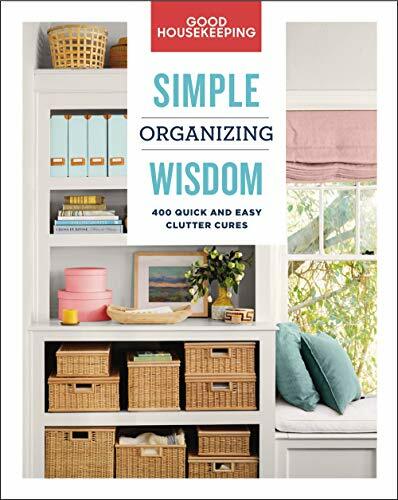 Chapters: Organizing Must-Haves, Kitchen & Pantry, Living & Family Rooms, Work & Craft Spaces, Bedrooms, Bath & Laundry Rooms, Entryways, and Garages.